Definition at line 46 of file collision_world_allvalid.h. Definition at line 39 of file collision_world_allvalid.cpp. Definition at line 43 of file collision_world_allvalid.cpp. Definition at line 47 of file collision_world_allvalid.cpp. Definition at line 52 of file collision_world_allvalid.cpp. Definition at line 61 of file collision_world_allvalid.cpp. Definition at line 71 of file collision_world_allvalid.cpp. 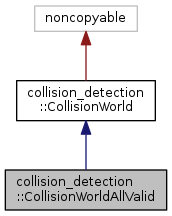 Definition at line 81 of file collision_world_allvalid.cpp. Definition at line 92 of file collision_world_allvalid.cpp. Definition at line 100 of file collision_world_allvalid.cpp. Definition at line 109 of file collision_world_allvalid.cpp. Definition at line 115 of file collision_world_allvalid.cpp. Definition at line 122 of file collision_world_allvalid.cpp. Definition at line 130 of file collision_world_allvalid.cpp. Definition at line 135 of file collision_world_allvalid.cpp. Definition at line 141 of file collision_world_allvalid.cpp.